At this point in my life I can say that I have every translation of a Bible that I want. 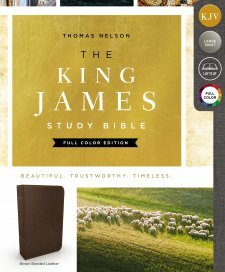 Now when I obtain a new Bible it is for the additional information provided thus the presentation of Thomas Nelson’s latest contribution to the Bible Geeks of the world: “THE KING JAMES VERSION STUDY BIBLE, FULL COLOR EDITION” really intrigued me. It is interesting to note that I have recently decided to go back to the basics of Scripture reading which includes reading the King James more than the New King James version of the Bible. There are four aspects of this Bible I am looking at: graphics, commentary, cross reference, and of course readability. I think most of us take the maps for granted and a picture here and there throughout a Bible is a bonus. The images in THE KING JAMES VERSION BIBLE, is truly more than what I was expecting. Archeological finds, pictures that relate to the text and of course the maps. The images definately help make the text relevant. The comments found at the bottom of the page help put various passages in context by defining various words. They also present information to help the reader understand the relevance to what was written. Finally it is good to know that in this version of The KING JAMES VERSION STUDY BIBLE Cross reference are available for various verses. There are also alternative translations of words or phrases. A bonus is the Hebrew and Greek names of God found in the comment section.